Weeks ago I would’ve have CSP as the clear favorite in this matchup. The Golden Bears looked like a squad that could compete and sometimes beat the mid to higher level teams. Since that time Augie has taken care of business while CSP has barely beaten Mary and Crookston and was actually outgained by UMC a week ago as QB Dom McKinzy completed just 2 of 14 attempts. For some reason, the Concordia offense has struggled against the worst teams in the league. AU is now 5-3 in what looked like a lost season. The Vikings aren’t mathematically eliminated from the playoffs or Mineral Water Bowl consideration but both are longshots at this point. Kyle Saddler leads the NSIC in total offense at over 300 yards per contest. Kirby Hora is still in the top 5 among tacklers and defensive end Joe Newman is near the top of the league in tackles for loss. If the CSP team of earlier in the year shows up, I’d go with that group. The way each team is trending though, it’s Augie going away. There isn’t a lot to say about the Beavers other than they are in freefall. Moorhead hosted USF in an immensely important game but the Dragons struggled to find and tackle Gabe Watson. A 3rd blowout loss this year to a top team shows the Dragons are good enough to beat mid-level programs but are still a good ways from the NSIC’s upper echelon. Moorhead should still have enough firepower to control things vs. Minot. Last Saturday Mankato showed everyone why it is the top ranked squad in D2. The Mavs handled Bemidji like nobody else has this season. Running Back Nate Gunn rushed a season high 41 times for 187 yards and a score. Kato has now scored over 30 points in all 8 games this season, 6 times over 40. It appears the Mavs are peaking at the right time. Wayne State reached the 2-win mark last week with a 34-0 victory at Minot. The Wildcats have lost plenty of games by a score or less this fall. However, the Mavericks will be the best squad the Wildcats have seen and they will likely struggle to slow down the unbeaten Minnesotans. SMSU won the initial Battle for the Sledge in 2015 but Winona comes in looking for its 3rd straight win in the series. The teams might very well be headed in two different directions. The Warriors are coming off a 20-point thumping by UMD while SMSU has won 4 of the last 5. Mustang QB Blake Gimbel has gotten comfortable with his wideouts and the SMSU offense is a very dangerous unit. With that, I’m going with Gimbel in this one, and for the Mustangs to regain the sledge. It’s funny how much things can change quickly within a season. In early October BSU had 1-loss and looked like it might make the playoffs and pose a serious threat to Mankato in Week 8. Since then, BSU has stumbled and is now forced to put back together the pieces after two crushing defeats. SCSU is in the first installment of the SR4 Regional Rankings (9th), lurking just outside the top 7 (which make the playoffs). While the Huskies have won 4 of their last 5, I still haven’t fully bought-in. Yes, they posted a signature win at USF a few weeks ago but I happen to think the Cougars had a post-BSU loss hangover that day. SCSU is just 1-2 against teams with a record of .500 or better and has scored only 6 more points than it’s allowed. That said, with Dwayne Lawhorn back at quarterback, the offense has far more stability and balance. The SCSU defense might be the most underrated unit in the league, allowing only 340 yards to UMD and 387 to Mankato (though the Huskies were gashed for 469 yards by USF). During this recent run halfback Greg Lewis is averaging 30 carries and more than 100 yards per game with the Huskies physical style fueling their success. This game really depends on which BSU shows up. If it’s the Beavers who played UMD and USF, they win this game by 2 scores or more. If BSU limps into this contest and isn’t up for finishing the year strong, it will get embarrassed. If they played this game 10 times, BSU wins 7. I’ve gone back and forth on this one all week but keep thinking BSU is the better club and good enough against the run to limit SCSU offensively. I expect a lower scoring contest here. UIU continues to be Jekyll and Hyde this season, getting thumped at SCSU a week after upsetting Bemidji State. USF got back on-track, dominating upstart Moorhead on the road. Cougar RB Gabe Watson ran for 320 yards and 5 scores in a highlight reel performance that’s now put him front and center in the Harlon Hill discussion. Watson leads all NCAA levels in rushing yards with 21 scores to boot. The fact USF likely won’t make the playoffs could hurt his HH chances as other top players will gain exposure and accumulate statistics in the postseason. Since UIU is on the road the pick seems simple. I’ll take the Cougars to continue their ground attack and win this one in a lopsided manner. UMD had a great win on the road a week ago at Winona and is at the top of the Regional Rankings. Crookston competed against CSP a week ago, dropping a 21-13 contest. All said, I’m expecting UMD to get reps for multiple signal-callers in this one, winning easily. A few weeks ago NSU was hanging with Augie and Winona but has now taken a step back. The Wolves defense is struggling to stop people, allowing 556 yards to SMSU and 506 to AU the last two games. Despite being injured, QB Hunter Troutman has played on but with the season now lost, don’t be surprised to see him shutdown. Wideout Dakota Larson continues to make big plays for the offense and should be a future star. Mary’s first year head coach Craig Bagnell is still waiting to reach the pay window. Mary was able to limit Augie a week ago to 363 yards but allowed 48 points due to big plays by the Vikings on defense and special teams. The week previous Mary hung around with CSP, losing 17-7. With things going a bit sideways for Northern, I’m stepping out and taking a chance here. Coach Bagnell gets his first win of the year. Quick reactions to the Regional Rankings..
UMD and MSU are in a virtual tie in all measurable categories. Given that MSU has a tougher schedule going forward and will be on the 1-line if both stay unbeaten, I’m unsure why the committee put UMD on top considering they will need to switch it. In any event, UMD will fall to number 2 or maybe 3 as they finish out the year against opponents who have won a total of 3 games. MSU still has a hurdle with USF, who always plays the Mavs tough in Mankato. Colorado Mines would be my early bet to land at 2 when all the smoke clears. West Texas plays 2 of the squads listed above and could impact the playoffs with a win, but their offense doesn’t look like it can hang with the other powerful Texas offenses. Layton Rabb (QB) from MW State looked like he might be repeating the run Commerce had a year ago with Luis Perez, as Rabb is near the top of D2 in passing yards, with just 1 interception. However, a loss this weekend against Tarleton might bump his squad out of the playoff hunt. Enter CWU, who has a weak SOS and lost to West Texas. If teams like MW State and Commerce both thump WTAMU, and CWU loses to them at home, that’s a bad look for CWU in terms of a common opponent as well. 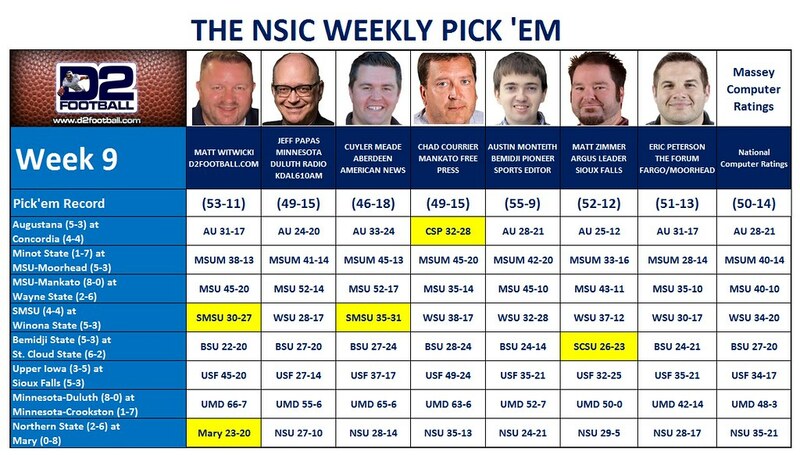 It’s too early to speculate here on how things will look after 11 weeks, but it seems same to say UMD drops a spot or two, Mines likely at the 2, CWU and MW State (if they lose today) will be fighting with SCSU (if they win out) for that 7 spot. Don’t be shocked if a 3-seeded Duluth hosts the National Champs, Texas A/M Commerce. And yes Mankato fans, I don’t see anything getting in the way of the Mavs getting the top spot if they win out. Great write up Witt. I like your gutsy call with SMSU over Winona. I think it could happen, but didn't have the nerve to choose them in the Pick 'Em. Also even more gutsy call with Mary over Northern. I was feeling good about both upset picks when SMSU was at 16-all in the 4th..and Mary....they were up the entire game and then found a way to lose it. Eh..
Now I gotta take more chances in the Pick'Em....since both games flopped on me. HA.